Creep-test for designing heat failure resistant systems. Will the Material Stand the Heat? Creep-test is used to determine mechanical properties for service at elevated temperatures. Materials behave differently when hot. The progressive plastic deformation occurring in metals under load at elevated temperatures is called Creep. Creep knowledge is required for structures designed to perform properly under heat. The temperatures considered are not the same for various materials. Materials are used for fabricating constructions suitable to operate at elevated service temperatures. Their Creep properties must be studied for designing failure resistant systems. A Creep-test involves the application of a constant load upon a tensile specimen maintained at constant temperature in a specially built test furnace. The load is usually a dead weight. Special devices called extensometers measure the strain or extension occurring in the specimen as a function of time. As the specimen elongates, its cross section decreases and therefore the applied axial stress increases, while the load remains constant. The recorded data permit tracing the creep diagrams during or after the actual tests which are conducted for very long periods of time. Creep occurs in three stages. The changing creep rate is defined as the slope of the curve, plotted as strain as a function of time. The first stage, or primary creep, starts at a rapid rate and slows down with time. The second stage called steady-state or secondary creep shows a relatively constant rate of deformation. The third stage known as tertiary creep has an accelerating creep rate and ends when the specimen is broken. Fig. 1 - Schematic Diagram of Creep-test showing Strain as a function of Time. The reason for the need to run the long time Creep-test is due to the fact that there is no way to forecast the beginning of the tertiary creep, except by actual testing. Therefore thousands of testing hours must be run for Creep-test of new or improved materials. Families of curves can be drawn by repeating the Creep-test at progressively increasing temperatures with constant load, or by progressively increasing the load at constant temperature. Primary creep represents a phase where the transient creep rate actually decreases as the creep resistance of the material increases by virtue of the deformation undergone by the material. In the case of lead, which is subject to creep at room temperature under the load of it own weight, primary creep is the most important process. 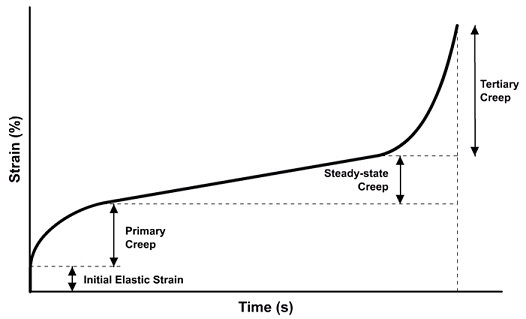 The nearly constant creep rate found in secondary creep, also called steady state creep, is interpreted as a balance between strain hardening and recovery. That is the temperature dependent restoration of physical properties without observable modifications of microstructure. The measured average of secondary creep rate is called the minimum creep rate. It is the most important design parameter for selecting suitable materials to be used in definite applications. Practically two standards are used. The stress to produce a creep rate of 0.0001%/hr (or 1% in 10,000 hours) is considered for creep resistant alloys used in gas turbines. For pressure vessels, boilers and steam turbine materials, the requirement is for the stress that produces a minimum creep rate of 0.00001%/hr (or 1% in 100,000 hours, equal to about 11 years and a half). Related to Creep-test is a simplified procedure, called Stress Rupture Testing that, without measuring the actual creep rate, tests the creep behavior of materials at higher loads and much shorter times. 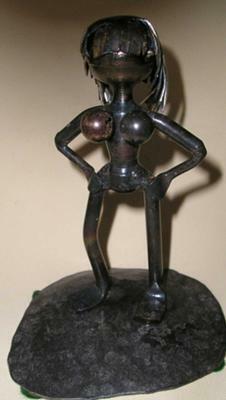 Here the material and its heat treatment condition are specified, as well as the specimen shape and dimensions. The test is performed in accordance with accepted Specifications for the material in cause, that establish the temperature and the initial stress. The results to seek by testing are the time and the elongation at rupture. These results must meet the minimum requirements spelled out in the applicable material Specification, for the particular batch of material to be acceptable. An Article on Modern High Temperature Testing was published (11) in Issue 155 of Practical Welding Letter for July 2016. To get at no cost every issue of Practical Welding Letter deliveret at your inbox, please subscribe.